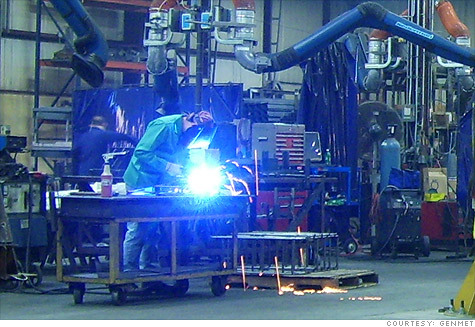 NEW YORK (CNNMoney) -- GenMet is a growing Wisconsin metal fabricating company that would be growing much faster if it could find one thing -- skilled workers. "Currently we employ just over 70 people," said Mary Isbister, the company's president. "We would be able to double revenue this year if we could find 20 more." Isbister said she's been turning work down on a daily basis because she needs more welders and workers to operate her laser cutters. Other manufacturers report shortages of electricians and machinists who can operate their computer-controlled equipment. You might think that it would be easier for manufacturers to find new employees. After all, the number of workers employed in factories is still more than 2 million lower than pre-recession levels due to layoffs or plant closings. But experts in manufacturing staffing say that many of the factory workers who find themselves without a job simply don't have the specialized skills now in short supply. "There are a lot of people out there looking for work who are assemblers, who are semi-skilled," said Jeff Owens, president of ATS, a manufacturing consulting firm. "There is definitely a shortage of people who are very capable to make the factories run." And while it might only take about a year of training for a person to get the skills they need, many blue collar workers aren't eager to try and find a new job in manufacturing after already being laid off. "The perception out there is that we're losing manufacturing jobs to China and India. So if they've already been displaced and they're going to go back to school, they're going for something not manufacturing-related," said Rob Clark, vice president of operations at Clark Metal Products, a company outside of Pittsburgh started by his grandfather and now run by his uncle. Clark said he's also having trouble finding skilled workers. Other manufacturers say they are getting plenty of applications when they post jobs, but in most cases it's not from people with the most relevant experience to work in the factories. "When we hire office workers, we get significant numbers of applicants who are qualified or overqualified," said Traci Tapani, co-President of Wyoming Machine, which is based just north of St. Paul, Minn. "But with production jobs, it's difficult to get the applicants we're looking for." Manpower, the global temporary staffing firm, lists skilled trades as the most difficult position for employers to fill, both in the United States and across 36 countries surveyed. Jonas Prising, Manpower's president of the Americas, said a big part of the problem is the reluctance of students and other young job seekers to even consider pursuing trades because of worries that the manufacturing sector is doomed. "If you look at the pipeline and the vocational colleges, it's not an area that has been replenished," he said. "It needs to be explained that these are good jobs that are difficult to outsource." And this is a problem that is likely to get worse for manufacturers, particularly as the labor market recovers and the skilled workers now on the job get closer and closer to retirement. ATS's Owens said there are some plants where the average age of the skilled workers is already in the mid-to-late 50's. As a result, ATS predicts that the number of manufacturers with a large number of unfilled positions for skilled workers could nearly double within five years.